Claims to the oldest Homo fossils include a 2.4-million-year- old mandible from Uraha, Malawi, a 2.4-million-year-old skull fragment from Lake Baringo, Kenya and a 2.3-million-year-old upper jawbone from Hadar, Ethiopia. For the most part though the period between two million and three million years ago there is little data and few fossils. Homo species had longer bodies than the short and stocky Australopithecus species. Since about 1.8 years hominins have been within the size range of modern humans. Male and females size differences characteristic of Australopithecus species decreased. The brain volume of Australopithecus species ranged between 400 and 500 cubic centimeters while the brain volume of early Homo species was between 600 and 750 cubic centimeters. scientists have different theories about which hominins evolved into more developed species and which lead to evolutionary dead ends. Some scientists believed that the Homo genus evolved from Australopithecus afarensis . Others believe it developed from Australopithecus afarensis . Bosei and robustus are believed to be evolutionary dead ends because they lived at the same time as Homo species. The various theories are difficult to prove. There is some debate as to whether the Homo genus evolved in East Africa or evolved in southern Africa and migrated north. Proponents of the southern Africa theory believe that the earliest Homo species evolved from A. africanus (Taung Child) and base their argument on the facts that arrangement of her teeth and brain size are similar to that of Homo habilis (the earliest Homo species), their fingers are humanlike and their brains were of similar size to Homo habilis . Although modern humans are the only members of the Homo genus alive today, other human species that belonged to the genus lived in the past. The earliest Homo specimen found so far lived about 2.8 million years ago. About a dozen Homo species have been identified although there is still intense debate as to how they all fit on the evolutionary tree or even whether they are unique species. Some of them, including Neanderthals, lived at the same as modern humans around 50,000 years. Others lived when modern humans were emerging around 300,000 years ago. And others still lived at the same time as Australopithecines more than 2 million years ago. “But Lucy and her species were not the only Australopithecines on the block. Over the years, researchers have reported uncovering two additional species from this period. If this latest discovery holds up, it would bring to four the number of known Australopithecus species living within this million-year span. These species range from Ethiopia to Chad. The research team that found the new fossils – upper and lower jaws that included teeth – have classified the find as belonging to a new species of hominin, a subset of hominins that includes modern humans and our direct ancestors. The researchers suggest that the new species, which they have dubbed Australopithecus deyiremeda, was a close relative to A. afarensis. The team's analysis appeared the journal Nature. “A. deyiremeda's remains were found at a site in Ethiopia's Afar region known as Woranso-Mille, about 22 miles north of another site rich in A. afarensis fossils – pointing to the possibility that the two species roamed the same general region at about the same time. With several Australopithecus species living in eastern and central Africa in the same general period, "we're looking at hominins who are potential candidates as human ancestors," says Henry Bunn, a paleoanthropologist at the University of Wisconsin at Madison. During this period, known as the middle Pliocene, the climate was getting cooler and drier. Vegetation and food resources were changing. “Looking at these Australopithecines, "you could almost think of them as ecological experiments as populations try to exploit new habitats and new resources successfully," says Dr. Bunn, who was not a member of the research team. "Most of those species went extinct." In the past, researchers had broken the last 5 million years of hominin evolution into blocks of 1 million to 2 million years, he explains. Based on the fossil evidence available at the time, "you only had one species per block of time," he says. At about 2 million years ago, with the emergence of the genus Homo, hominins became more diverse. With Lucy and subsequent discoveries, it now appears that the middle Pliocene also hosted a diverse array of hominins that included at least one additional group beyond Australopithecines – a group represented by Kenyanthropus platyops. The newly discovered jawbones and teeth – dated to between 3.5 and 3.3 million years ago – shared some characteristics with A. afarensis and others with K. platyops. This period also coincides with the appearance of the earliest stone tools yet found, a discovery announced last week in another paper in Nature. “The new species is yet another confirmation that Lucy’s species, Australopithecus afarensis, was not the only potential human ancestor species," according to Yohannes Haile-Selassie, curator of physical anthropology at The Cleveland Museum of Natural History who headed the team making the discovery. “Current fossil evidence from the Woranso-Mille study area clearly shows that there were at least two, if not three, early human species living at the same time and in close geographic proximity,” he said in a prepared statement. Homo Habilis skulls Homo habilis , meaning "handy man," was dramatically different from his predecessors. Homo habilis appeared around the same time as the first stone tools. Some scientists suggest the transformation from Australopithecus to Homo habilis was brought about by climatic changes. Geologic Age 1.4 million to 2.5 million years. Very few H. habalis remains have been found, but scientists speculate he survived about a half a million years. He lived at same time as Australopithecus boisei. Linkage to Modern Man: Seen as direct ancestor. Not clear what Australopithecus species he evolved from. Discovery Sites: Eastern and southern Africa. Discovered at Olduvai Gorge, Tanzania in 1959 by Mary Leakey and found near Lake Turkana at Koobi Fara, Kenya by B. Ngeneo and the Sterkfontein and Swartkrans in South Africa. Leakeys. The Lake Turkana remains are housed at National Museum of Kenya in Nairobi. Size: Small compared to modern humans. males: 4 feet 4 inches; females: 3 feet 10 inches, 71 pounds. Skull Features: Primitive face, back teeth narrower. Larger brain and smaller human-like jaws and teeth than those found on Australopithecus species. Body Features: More similar to modern man. 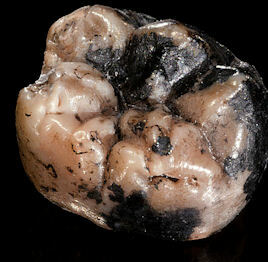 Homo Habilis tooth Brain Size: 630 cubic centimeters, significantly larger than predecessors. Although half the size of modern man's brain, it's brain was large relative to body size and almost the same relative size as the brain of modern man. There was a pronounced bulge in the area of the brain associated with speech. Scientists say it probably didn't speak because it's vocal chords were not developed enough. A human brain is about 1,350 cubic centimeters. A chimpanzee’s brain is 390 cubic centimeters. A February 2009 article in Science announced the discovery of 1.53-million -year-old footprints found at Ileret, Kenya. The footprints, likely made by early Homo habilis or Homo ergaster , were heralded as the earliest evidence of modern upright walking. The large toe was parallel to the other toes, indicating an upright posture. The 3.6-million-year-old prints found in Tanzania and attributed to an Australopithecus species indicated an upright posture but had a shallower arch and an apelike divergent toe. The discovery was announced by a team led by Matthew Bennet of Bournemouth University in Britain. Homo habilis appeared around the same time as the first stone tools, which included cobbles and choppers made from lava. Some of the tools were made of materials not found in the area where the tools were found. This implies the materials were carried to the area where they were found from a distant site, which in turn implies the transportation of goods of even trade. Homo habilis consisted mostly fist-size hammerstones and small, sharp flakes. Scientists believe that Homo habilis and his tools were too small too hunt large prey. The tools, they theorize, were used mainly to fight off competing scavengers for the large carnivores such as lions and cut the hides and break open the bones of their scavenged meals. Homo habilis deliberately hammered and shaped rocks into these tools. In an August 2007 article in Nature, Maeve Leakey of the Koobi Fora Research Project announced her team had found an upper jawbone of a Homo habilis east of Lake Turkana in eastern Kenya dated to 1.44 million years ago, making it much more recent than other fossils from the species. Homo ergaster It had previously been theorized that Homo habilis and Homo erectus lived at different times and Homo erectus evolved from Homo habilis . The discovery by Leakey’s team however seems to counter this finding, suggesting that the two hominins lived together for around a half million years, which in turn makes it unlikely that Homo erectus evolved from Homo habilis .The finding does not challenge the theory that Homo erectus are the direct ancestors of modern humans but it does call into question whether Homo habilis was. The 1.44 million-year-old Homo habilis fossils were found several years before but extra care was taken identifying the species and dating the fossils, which was done from volcanic ash deposits, to make sure they got it right since the implications of the finding are so dramatic. 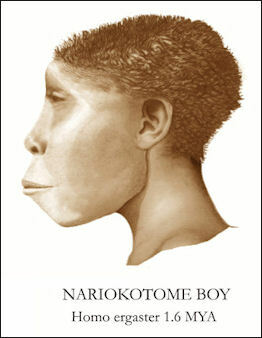 homo ergaster Nariokotome Boy Homo rudolfensis , is a hominin species that lived between 2.5 million and 1.9 million years ago. Little is know about this hominin which sprung up about a half million years before Homo habilis died out. 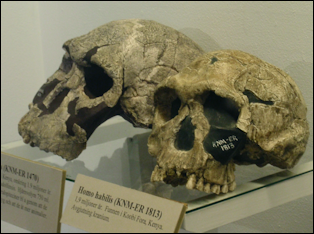 Many scientists regard Homo rudolfensis as a member of the Homo habilis species. If not it is the earliest known homo species. Skull Features: Long, broad face with flatter browridges and a larger, rounder braincase that Homo habilis . Discovery Sites: Eastern Africa. Omo, Ethiopia; Koobi Fora at Lake Turkana, Kenya; Uraha, Lake Malawi. Homo ergaster is a hominin species that lived between 1.8 million and 1.4 million years ago. 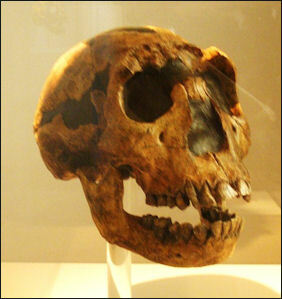 Many scientists regard Homo ergaster as a member of the Homo erectus species. Skull Features: smaller jaws and a more projecting nose than earlier Homos. Body Features: Arm and leg proportions more similar to modern man. Discovery Site: Koobi Fora at Lake Turkana, Kenya. "Turkana Boy" is a nearly complete skeleton and skull from a 12-year-old boy that lived 1.54 million years ago and was discovered in 1984 near the shores of Lake Turkana not far from Nariokotome, Kenya. Some scientists think he is Homo erectus . Others regard him as distinctive enough to be regarded as a separate species--- homo ergaster . Turkana Boy was about 5-foot, 3-inches tall when he died and probably would have reached a height of about six feet if he reached maturity. Turkana boy is the most complete skeleton of a hominin more than a million years old. Three Homo Species Living at Same Time: Homo Erectus, Homo Habalis and Homo Rudolfensis? 2.8-Million-Year-Old Fossil Found in Ethiopia: the First Human? “Cut marks made by stone blades on fossil bones, particularly small antelopes, showed signs that the animals may have been hunted, or at least encountered first, by the early humans before other preying animals reached the carcasses. “The overall pattern of hominin access to the complete carcasses of small antelopes may be the signal of hominin hunting”, writes Plummer. “If so, this would be the oldest evidence of hunting to date in the archaeological record”. Homo gautengensis is a hominin species proposed by biological anthropologist Darren Curnoe in 2010 based on the analysis of a partial skull found in 1977 at Sterkfontain Cave near Johannesburg, South Africa. Some scientists had earlier classified the fossils as Homo habilis or Homo ergaster. Others said they belonged to an Australopithecus species. Curnoe has argued that Homo gautengensis is the earliest species in the genus Homo. The view is controversial to say the least. Many scientists dismiss the idea that Homo gautengensis is a unique species. “In their new findings, the Leakey team says that none of their newest fossil discoveries match erectus, so they had to be from another flat-faced relatively large species with big teeth. The new specimens have "a really distinct profile" and thus they are "something very different," said Meave Leakey, describing the study published online in Nature. What these new bones did match was an old fossil that Meave and her husband Richard helped find in 1972 that was baffling. That skull, called 1470, just did not fit with Homo erectus, the Leakeys contended. They said it was too flat-faced with a non-jutting jaw. They initially said it was well more than 2.5 million years old in a dating mistake that was later seized upon by creationists as evidence against evolution because it indicated how scientists can make dating mistakes. It turned out to be two million years old. Are Hobbits Evidence That Homo Habalis Left Africa? The origin of Homo floresiensis (the hobbits of Indonesia) raises some interesting questions, one being that they could be descendants of predecessor of homo erectus —homo habalis or even a Australopithecus species — and this in turn could mean homo habalis or Australopithecus species could have emerged from Africa before Homo erectus. “The other hypothesis states that Hobbits descended from smaller and more ancient hominins like Australopithecus africanus or Homo habilis that were already diminutive at the time they reached the island. Both theories have challenges. One might accept that Homo erectus grew smaller in stature by two-thirds over time. After all, a smaller body is easier to feed. But for some scientists, it is hard to believe that it made evolutionary sense for its brain to shrink by half. Losing brain power doesn’t seem like a likely evolutionary development. On the other hand, if you buy that Homo floresiensis was descended from Australopithecus or Homo habilis, then you have to explain how either of these species made their way to Indonesia when their remains have never been found outside of Africa. \*/. A bone study published in 2017 in the Journal of Human Evolution showed there was nothing to support claims that Homo floresiensis evolved from Homo erectus, which scientists say was an ancestor of modern humans, and thus did not have any direct links modern humans. Teeth similarities had been suggested as evidence that homo erectus and hobbits were linked.